Welcome to the first installment of our new monthly series, Day in the Life! Through this Q&A series, you’ll get an inside look at the day-to-day lives of some of the most inspiring women in business. To kick things off, we sat down with Rachel Krupa, a true force of change in the health food and wellness industry. At her PR agency, Krupa Consulting, Rachel promotes food and wellness brands through press, social, and events. 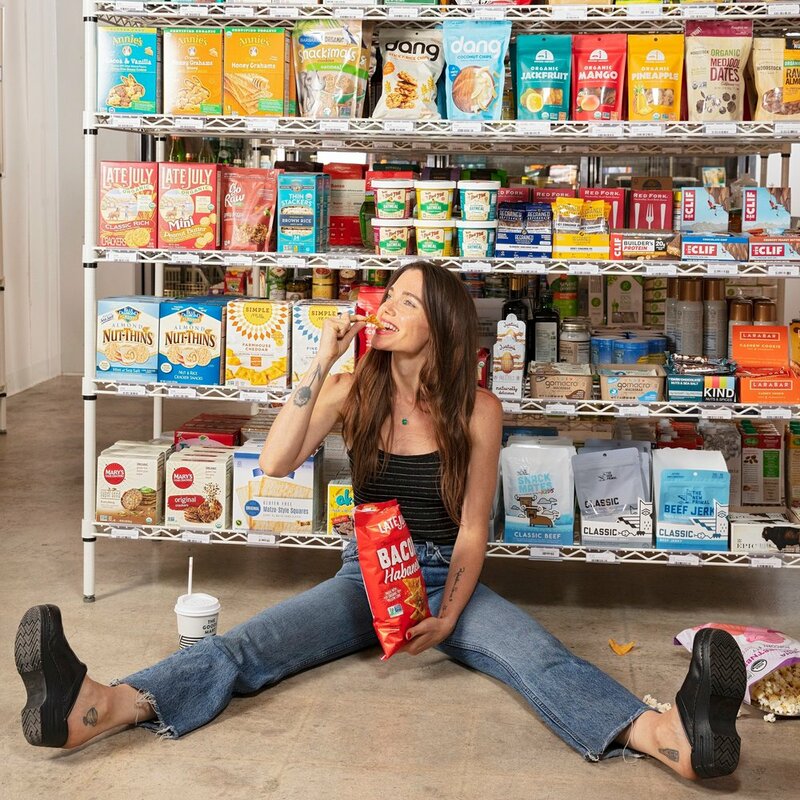 Her newest venture, a “healthy convenience store” called The Goods Mart, puts her knowledge of that same space to work through what The New York Times calls “A 7-Eleven for all you organic people.” Read on to hear Rachel’s take on routines, self care, and the best snacks at her shop right now. Are you a night owl or a morning person? When do you do your most important work and why? Honestly, I’m both… I love getting up early and hammering through emails or taking calls before 9am, and then I get my second wind at 5 or 6pm. I love the quiet, calm feeling in the mornings and the energy that the just post-dusk evening brings. I live for the the sunrise and fall peaks of each day. What time do you get up? What’s the first thing you do upon waking? I wake up around 5:45-6:30am – it just depends on my day! But every day, I wake up and roll right into a workout class – Pilates or yoga! What does your morning, pre-work routine look like? I like to have a structured morning…wake, workout, and after the workout, I mediate when I get home, drink a liter of water, listen to music, dry brush, oil pull (while showering), take my Chinese herbs, collagen, and sprinkle on some essential oils with quick glance at emails to see what’s coming in…I try to swing by the store before heading into the office if I don’t have a meeting. What’s your commute like? Do you listen to music, podcasts, or audiobooks? Any current faves? During my commute, I’m either listening to music or rolling calls. I keep it simple — KISS FM, or still listen to Pandora (so old school ☺). Right now I’m obsessed with the “Dreamy Snowy Day” channel. You own a consulting business and also run The Goods Mart. What’s the best and worst part of running two very different businesses? Crazy enough, my two business actually compliment each other. Krupa Consulting is a PR agency focusing on food and wellness. We work with incredible restaurants (Shake Shack, Milk Bar, maman, Hanoi House, Monty’s Good Burger, byChloe), the tastiest CPG brands (MatchaBar, McConnell’s Ice Cream, Vital Farms, Good Catch, This Bar Saves Lives), and the best wellness brands (goop Wellness, Clean Market, WTHN, Fleur Marche). Our goal is to build media and consumer awareness and we often discuss how to drive more traffic to their stores, studios, and sites by sharing the cool things they are doing. With The Goods Mart, I’m pretty much doing the same thing but it’s my own brand. I’m never not learning something! I’m able to see what consumers are talking about in the store and share it with our brands. It’s FUN to get real time feedback from real customers! The worst part - I wish there was more time in the day to get more done! And juggling two inboxes can get a little crazy at times. What are some exciting projects you’re working on this month? Last week, I was at Fancy Food in San Francisco, a very large specialty food and beverage show where we got to see and taste the new products and trends in food. We had a handful of clients exhibiting, and then I walked the show to find cool new products to bring into The Goods. Also this week, Monty’s Good Burger just launched the Impossible Burger 2.0, we’re doing desk sides with Fleur Marche in New York, and I looked at a few new spaces to potentially open another store!!! We just signed a few new clients, Kiito (an incredible plant-based protein drink) and Juneshine (a hard Kombucha), so this week we’re in planning mode with them. It’s our time to get really creative and present our ideas. We’re also doing a farm visit with our client Roam, a female-centric cannabis vape company. I love how transparent our clients are and how they welcome us to see all parts of their business. I’m jumping on a red eye on Wednesday (I’m not excited about that), but on Thursday, I’m speaking on a panel. The Goods Mart will be curating all the snacks for the event and we’re bringing in our slushie machine! I’m excited for the event guests to try our kombucha slushies! Do you ever reach inbox zero? How do you handle the constant influx of inquiries and communication entrepreneurs are so familiar with? In my dreams, my inbox would be at zero! Earlier in my career, I couldn’t sleep if I had unread emails, but boy, times have changed. Now, I actually mark emails as unread if I need to keep them on my radar. I also believe email is not always the best method of communication. Slack has been a lifesaver for internal communication for both Krupa Consulting and The Goods Mart. It helps to streamline communication and greatly reduced office chit chat! What product are you currently most excited about selling at TGM? Why? It’s really had to narrow them down! Rind – it’s a local Brooklyn brand that dries fruit with the skins on. The persimmons and kiwis are ridiculously good. We just brought in a new spice soda called Dona – the pink peppercorn lemon is so refreshing! I’m also a fan of Laiki (they taste like a Bugle, but with only 3 ingredients) — we’re the first to carry their new Vegan Cheese flavor. Little Secret Wafers (hello, better-for-you Kit Kat)! Dang Sticky Rice Cakes — I just polished off a bag. …and last but not least.. our pineapple kombucha slushies! What are some work habits that help you stay healthy, productive, and on track to reach your goals? At our office and in the store, I believe you need to create a mood to be more productive and keep energies high – it’s about the smells, the music and the energy of the work environment. We always have aromatherapy on (or burn incense). In the office, we alternate playlists to coordinate how people are feeling, while in the store, we have some really rad playlists created depending on the time of day. At Krupa Consulting, we try to step away from our computers during lunch so we’re not eating and working. Each team meets on Mondays to discuss the goals for the week for our clients and then meets again on Thursday or Friday to discuss how the week went. It keeps the communication flowing! And I’m a believer in getting out of the office during the day to walk around and clear your mind. Every day at 4pm, I walk to get a matcha. It’s my time to clear my mind so I can finish the day strong. It’s also important to add small hints of wellness into your day – rub on a dab of essential oil, think about breathing, talk about something really random to make yourself and other laugh. We all work REALLY hard, but you need to break it up, even if it’s for a minute. Any favorite apps you use regularly? Top used apps currently are: Slack, Dropbox, Delta, Square, Instagram, Insight Timer, and Sleep Cycle. What are you reading/watching right now? I need to read more books… I have Howard Schultz “Pour Your Heart Into It” on my nightstand. Before I go to bed, I need to watch an easy show it helps transfer my mind away from emails. My guilty pleasures are The Magnificent Mrs. Maisel, New Amsterdam, and You. How do you spend an average evening? An average night is spent doing more emails from home. I turn the lights low, blare some tunes, and spend some quality time with my inbox. But at least two nights a week, I make plans with friends/clients to have dinner and catch-up sessions. I’ll also toss in, weekends are very much a time for self-care. I regularly get massages, acupuncture, and IV drips. I need to give my body some TLC because I know I push it hard. When do you go to bed? What’s your “optimal” # of sleep hours? I tried to be in bed by 11pm, but normally it’s closer to midnight! I aim for at least seven hours a night, but I feel good as long as I have more than six hours. What’s the most rewarding part of your day? Going to work! I love what I do and the people I get to work with daily. The teams at both Krupa Consulting and The Goods Mart are stellar; they put their heart and soul into it. I’m inspired by them daily. We also get to work with so many outstanding brands. At The Goods Mart, we’re able to introduce new, better options to our customers and have them leave with smiles on their faces. Shopping can be FUN! WTF Is a Cap Table & How Do I Read One?